DON'T LOSE THE SOUND...AMP IT! 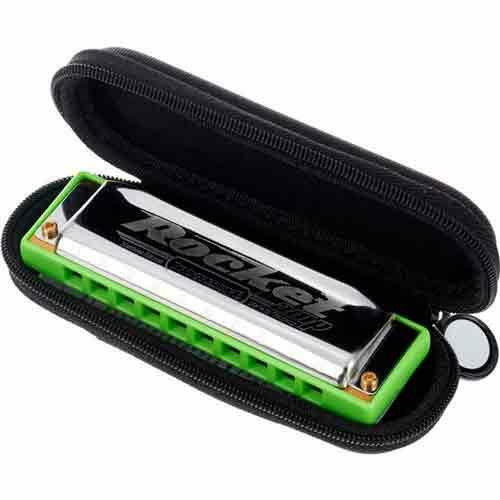 With the Hohner Rocket Amp harmonica, Hohner has developed one of the world‘s loudest and most comfortable harmonica models. The green Amp version is technically identical to the standard Rocket, but features covers without side vents, which facilitates a tight enclosure when cupping the harmonica with a microphone for amplified playing. The ABS green comb with rounded sides and edges ensures a supremely comfortable playing experience and allows great control of the instrument. Provided with a more slick and useable single soft case. This is a powerful, dynamic harmonica that is perfect both for live work and recording sessions. Covers without side vents facilitate amplified playing via a microphone.